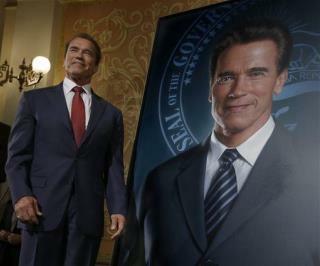 (Newser) – When Arnold Schwarzenegger sat for his official portrait as the governor of California back in 2003, things were apparently just fine between him and his then-wife, Maria Shriver. 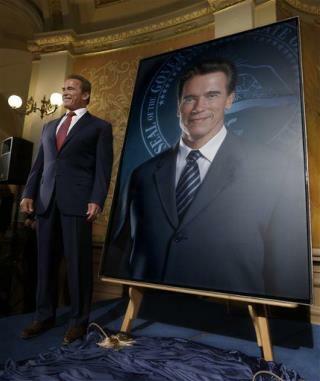 Now, not so much—which is probably why, when the 6-foot-high oil painting was unveiled at the Sacramento statehouse Monday, all evidence of Shriver had been scrubbed from it. 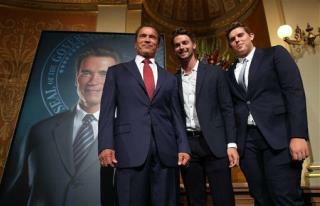 His ex-wife's face was originally seen on a lapel pin Schwarzenegger was wearing when he posed, Page Six reports, but it had been covered up by the unveiling. This is what the Soviets used to do back in the day when Stalin would eliminate his cronies. At least they could have touched it up better. 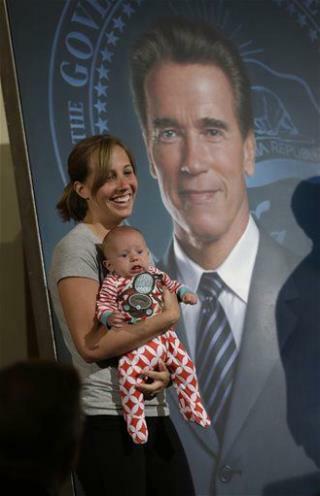 I'd have painted on an old Gerald Ford "WIN" button, or maybe an "I Like Ike" button. 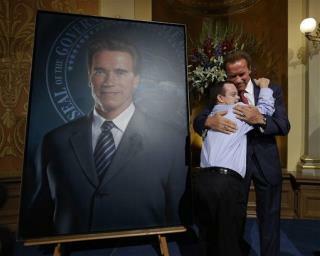 Arnold's a GOPer, after all. The sad story about marriage. Over 60% end up in divorce. Marriage is like a crap shoot. Just when you think things are going good. Someone dumps on you! I can understand why they invented the prenupt agreement. Then everything is understood ahead of time. Everyone is fully informed. If someone decide they want out. They at least know where it will end up. 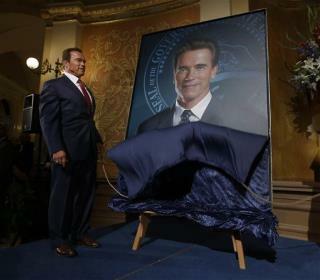 I'LL BE BACK!! AGAIN & AGAIN & AGAIN......ETC. UNTIL I GET MY CYBERNETIC BODY!! 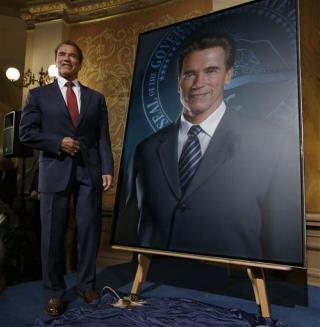 TO POWER ME OVER THE NEXT 120 YEARS in POLITICS!! D__KWADS!! There ya go!